I love making doilies and potholders, but I have to admit, there is just something really special to me about crocheting for a baby. I cannot even count all of the blankets, caps, jackets and booties I have made through the years, and I loved making them all. I know I am not alone; many people have told me they learned to crochet by making a gift for a special baby, and sometimes that was the only time they ever crocheted. If you look at the crochet pattern sellers on Etsy, some of the ones who have the most sales specialize in booties, caps and the cute little cocoons that are so popular right now. But I am a threadie, and I guess I am old fashioned; and I really love the dainty look of baby items made from thread. I recently designed a set of baby booties that also incorporate ribbon weaving. They were a lot of fun to make, not so much fun to write the pattern for! There are three different styles of booties included in the pattern. Baby Blankets! Because when I was pregnant with my first child years ago, I didn't know how and had no one to teach me. (This was before internet/you tube taught people) So he was born and didn't have his crochet blanket, but about a year later my grandma gave me a book she had from the 70's. It was a Woman's Day granny square book, and my mom knew a few stitches, so I slowly learned. He had his crochet blanket at 1 year old. :) I love making baby blankets for babies so that's what I give everyone I know who is expecting. I love making doilies!! But I make more things for babies. Right now I am working on afghans,bibs and booties for twins.I do enjoy making just about anything for babies. My favorite is things made with the thread, potholders..my fave. I love making booties and towel toppers. I love making baby hats and booties! They are so precious and cute! The babies are too! My favorite thing to crochet is to crochet doilies. Doilies! They are a complete project that doesn't take too much time or supplies. My favorite thing to crochet is baby items, for my beautiful 2 months old grandson and I'll have another grandson in June, I'm in grandma heaven,LOL. I also like crocheting doilies. At this point I am enjoying Crocheting baby items. We have a new Great-Granddaughter due May 14th and crocheting for her. 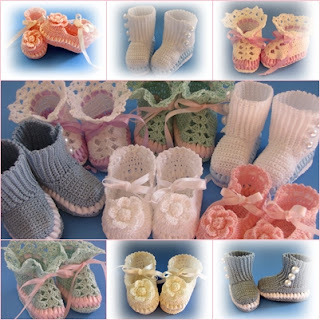 I love everything about the crochet, but I haven't grandchildren so I do not things for baby.Io prefer to work as a colored pot holders, doilies, baskets with flowers and also amigurumi, why not? I, like you, love making doilies. However, I also adore those very old vintage baby bonnets that I see online occasionally. I have attempted a few and unfortunately the patterns are not terribly easy to follow. Recently, though, I made two sets of your booties and hats for a couple of people at work. I love the ribbon weaving in them and have done that before with another pattern out of a magazine. My favorite will always be doilies. it means so much more. My absolute favorite crochet projects are thread baby items. I would have to agree with you, Ann, about the sweetness of thread booties. My late mother-in-law made multiple pairs of thread booties for all of her new grandbabies and I still have the ones she made for mine (and the oldest is 44). She is responsible for my love of all things crocheted with thread!! I am a thready..so anything made with thread..I go through stages, potholders, doilies, booties and caps. By the way..I have made your booties and caps. I love them and so do the new mommies. I posted pics on my blog of them if you want to take a look. Wow! That's a good question, and it's super hard to decide! I think I get into a cycle of an item a bunch of times until I switch it up. Sometimes it's a bunch of doilies in a row, then baby afghans, then scarves/headbands/neckwarmers, then bead crochet necklaces and jewelry. I guess one of the must unusual/fun/exciting items would be my Ugly Blankets that use up all my leftover scraps. It's SO much fun putting those together remembering previous projects or the friends and family that have shared random skeins of yarn with me! Thanks for the chance to win. =) Have a great weekend! I love making things for my children. They have such a good time picking out colors that they want and encouraging me alone the way to finish. I can't pick just one thing!!! My likes depend on who or what I'm crocheting for! I do love thread crochet, though, I just wish that some of the patterns I see for clothing from around the world would make their way to the American market! I like thread crochet the best, and so far it is doilies. I'm addicted to crocheting doilies. Hats are my thing, but I love flowers too! Anything and everything, as long as I have a hook and some yarn I am happy! Ann, I am a thread person with a love for crocheting colorful doilies. Thanks for the contest! If I had to pick just one item... it would be my little stained glass thread crochet crosses... but if I could pick one more item, it would be thread crochet treetop angels! Well I used to love to do afghans years ago but then I got into thread I love to make doilies.